A passenger peruses books at a “Book Stop” in Sao Paolo. Photo by Parada do Livro. What if bus shelters were also mini libraries? What if, while you waited for the bus, you could pick out a book, and take it with you on your way to work? This is the proposal of two university students from Sao Paulo, Brazil: Helena Aranha and Helena Nabuco. 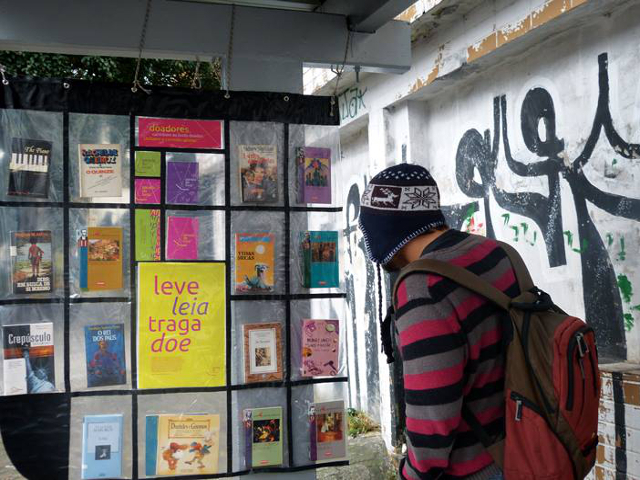 Their project, Book Stop, is working to install shelves stuffed with literary works at ten bus stops across Sao Paulo. The Book Stop is an example of a public improvement project enabled by crowd funding, where citizens interested in encouraging reading could donate as little or as much money as they wanted to. The goal is to encourage reading in Brazil, a habit which is not as popular or widespread as some would like. According to data from the third edition of “Retratos da Leitura no Brasil” (Portraits of Reading in Brasil) made in 2011 by Instituto Pró-Livro (The Book Institute), only 18% of Brazilians consider reading a pleasurable activity and the number of non-readers (people who have not read any book the last three months) increased from 45% to 50% in the last four years. Another startling, but seemingly unrelated statistic, is that the average citizen of Sao Paulo spends an average of two and a half hours sitting in traffic every day. Book Stop works to alleviate two problems at once: improving the experience of sitting on a bus stuck in traffic while encouraging citizens to enjoy reading. The books on Books Stop’s book shelves come from donations by individuals, cultural centers, organizations, and the passengers themselves who take and leave books as they please. The first bookshelf design has already been installed at a stop in Vila Mariana, and the other nine are on the way. Whether the books will be returned by their readers is unknown, but Aranha and Nabuco like to think that people will see the value in the shared public property, and return the books they’ve borrowed so that others can enjoy reading them too.